The database HETRINA is showing three Hessian soldiers who participated in the ARW and who have a particular and similar name. HETRINA is an electronic database containing all the military files of the Hessians stored at the Marburg Archives. Anyone can access this database from his home anywhere in the world. But, HETRINA doesn’t display all of them, because I found many « arrival files » in America and North America for Hessians who participated in the ARW, files that are not part of HETRINA’s database. I’ll tell you later about these Hessians. 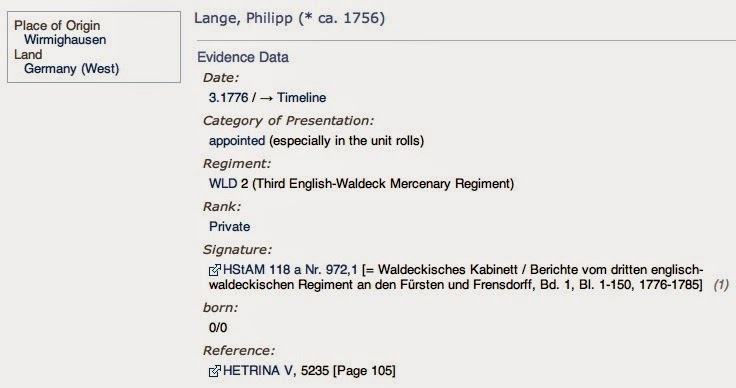 Sifting through the files, some 30 000 of them, I found three Hessian soldiers by the name of Philipp Lange or Lang. Some soldiers go by the name of Lang, but most of them are identified as Lange. In the 18th century, it seems to me that the Langes were in greater number in Germany than Langs. 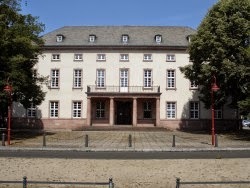 I suspect that, at the Marburg Archives, they have a policy about the recording of names. They had to simplify the many versions of names in the same family across centuries. That’s my interpretation based solely on my intuition. A military file usually contains enough information to make a clear distinction between soldiers. Here are the military files of each one of these three soldiers named Philip Lang. was born in 1748 and died in 1776.
but was recruited in September 1778. He was a member of the ERB 5 Regiment. in the ARW in 1775.
that he was enlisted, but no date is given. and possibly sometime in 1775.
in the Principality of Waldeck. 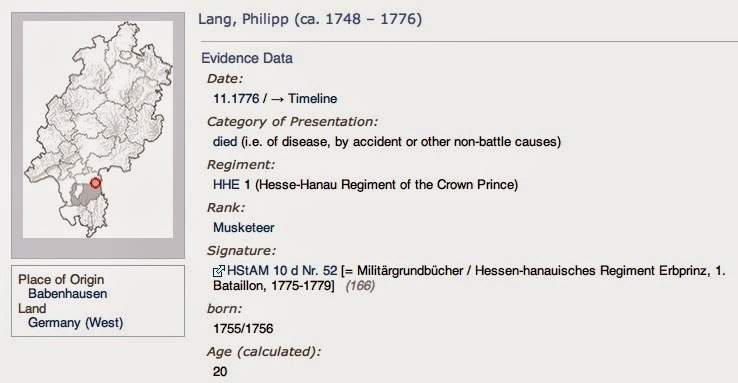 Even though there are three Philip Lange in the Hessian army, it doesn’t give more credence to one of them being my ancestor. If there are twice as much dogs on your street as there was 10 years ago, it doesn’t mean that you own one today. Wirmighausen is a small town with a total of 415 inhabitants. I assume that, in 1775, its population was quite less. From HETRINA, I learned that there were four Hessian soldiers who lived there at the time of their enlistment. Surprise! Two of them have the same family name: Philipp and Heinrich Lange. Were they brothers or cousins? Maybe. I haven’t been able to find their birth certificates, yet. It would be interesting to get these birth certificates, but it would not prove that one of them is my ancestor. Rather, I plan to bypass this difficulty by getting a DNA test, eventually, from a Lange of that region: that seems to me as the most efficient strategy! Looking at the military file of both of them, I got another surprise. 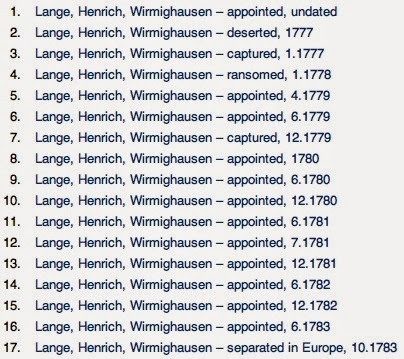 In the case of Heinrich, I was simply baffled to read about the nature of some of his seventeen (17) different entries. Philip has three (3) of those entries. Most of the Hessians have one to three entries. Since Philip deserted in 1778, it is obvious why his number of entries totals only three (3). Note. Each one of these entries serves the same purpose as the muster roll does in America. It says that the soldier as a specified status on a particular date. The muster roll is used also as a payroll guide. Heinrich stayed all through the duration of the ARW in the Waldeck regiment. There is no indication as to when he was mustered and appointed to leave for America. At the end of the ARW, he went back to Germany and quit the army soon after. Did he return to America? There is no indication, yet, that he did. But, some did return. 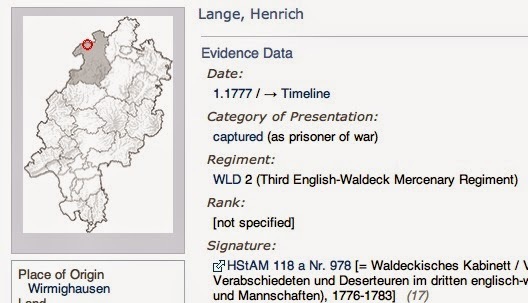 In the LAGIS database, it is indicated that Philipp & Heinrich were in the same Company of the Waldeck Regiment until 1778, while Burgoyne puts them in two different companies during the entire campaign. In 1777, Heinrich & Philipp were made prisoners, but they deserted. The next year, Philip did the same thing, but didn’t return to the Waldeck. I think Philip enlisted in the West Florida Royal Foresters, some time during or after 1778. Their military files make them look like Texas cowboys! What is so surprising about these military files? 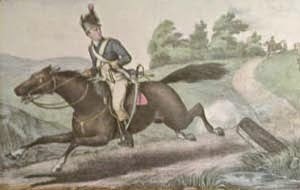 According to Todd W. Braisted of the Loyalist Institute, Hessians would not be permitted to come back to their regiment after they had deserted. That’s what their rule book said, but the reality was something else. Not only did Heinrich came back after his desertion, but the Regiment paid a ransom for his return. Moreover, he was captured a second time. Once more he came back: that second time, the regiment didn’t have any reason to refuse his return. It seems pretty obvious that the Hessians needed all the manpower that they could muster. Desertion was contagious among the soldiers and, so, they had to soften their strict discipline. No Hessian was hanged for desertion in America. Many of them were even discharged of their duties and allowed to stay in America instead of returning to Germany. A search in HETRINA revealed that many Hessians deserted twice or more and came back to their regiment afterward. There are so many that I’m not sure what « desertion » really meant during the ARW. According to HETRINA, 3 030 soldiers « deserted » during the ARW. The majority deserted only once, but many deserted more than once. It seems that, in some cases, it meant simply staying in a village close by for a few days. These soldiers were most of the time waiting in villages for a battle to start somewhere. Often, they had to wait weeks and months before picking up their gun. But, desertion might also mean something else. Desertion could have been used as an effective war strategy. For instance, there is the much-publicized case of the Revolutionary war double agent, John Champ, who tried to capture Benedict Arnold by convincing the British to accept him as a deserter. You’ve got to be naïve to believe that this was an isolated case. Spying is not a war strategy that was created in the last century. Could it be that desertion was used as a « disguise » by spies? 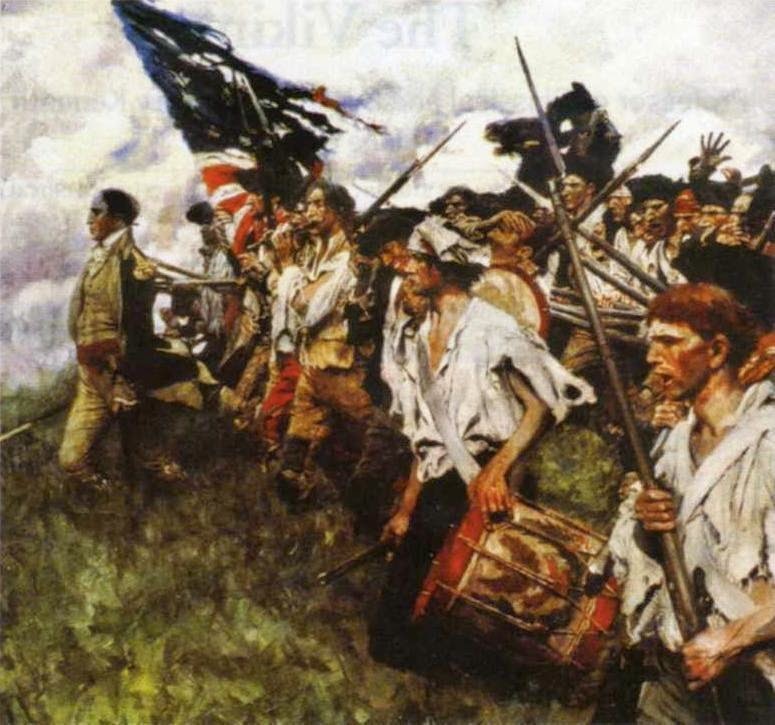 Since one expert estimates that as many as 25 percent of the men who enlisted in the cause of American Independence ultimately deserted the ranks, maybe this question is not as farfetched as it seems. Let’s read how Joseph Lee Boyle summarized the reasons why desertion was so widespread during the ARW. « Thus, on the 5th of January 1777, a party of about fifty Waldeckers was attack by a body of militia, ‘not superior in number’, who killed eight or ten and made prisoners of the remainder, including two officers ». Lowell, Edward J.. The Hessians and the other German Auxiliaries of Great Britain in the Revolution War. Corner House Publishers., Williamstown, Massachusetts, 01267, 1975. SBN: 0-87928-012-3. Now, look at Heinrich's military record for that period of time: he was one of those POWs. The officers on both sides were always apprehensive of deserters. They were cautious because each side was sending « dummy deserters » on the other side. Hypocrisy comes with war just as guns do. While reviewing documents on the subject, I came across a revealing Wiki on the subject of « intercepting communications during the ARW ». « The Continental Congress regularly received quantities of intercepted British and Tory mail. On November 20, 1775, it received some intercepted letters from Cork, Ireland, and appointed a committee made up of John Adams, Benjamin Franklin, Thomas Johnson, Robert Livingston, Edward Rutledge, James Wilson and George Wythe "to select such parts of them as may be proper to publish." The Congress later ordered a thousand copies of the portions selected by the Committee to be printed and distributed. A month later, when another batch of intercepted mail was received, a second committee was appointed to examine it. Based on its report, the Congress resolved that "the contents of the intercepted letters this day read, and the steps which Congress may take in consequence of said intelligence thereby given, be kept secret until further orders." By early 1776, abuses were noted in the practice, and Congress resolved that only the councils or committees of safety of each colony, and their designees, could henceforth open the mail or detain any letters from the post. (7) And in the vicinity of Manhattan and Long Island during the period from 1776 to November 1783. According to Philip’s military file, he deserted in August 1778. He could have been in the area of Pennsylvania at that time. 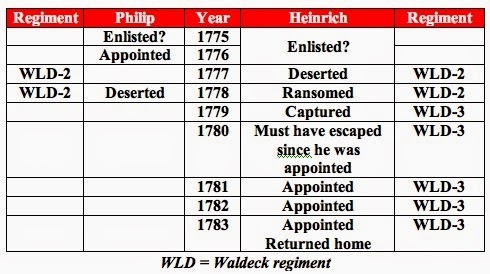 Philip could have deserted the Waldeck regiment in order to join a loyalist regiment the next day (for instance, the Pennsylvania Loyalists) and accompany the 10 000 soldiers and citizens from New Jersey to Florida. In 1781, he is listed in the West Florida Royal Foresters. The WFRF was a cavalry Loyalist regiment. He deserted the WFRF to enlist in the King’s American Regiment in 1781: the WFRF was dismantled on May 10, 1781. With Philip, desertion took another meaning: going from one cavalry regiment to another cavalry regiment. on the spur of the moment, but always on horseback. Conclusion. For those who believe that desertion always happens the same way for the same reason, I recommend that you read a few documents about it. And, if that doesn’t change your perception of it, try surfing in HETRINA in the desertion section. That should do the job! I strongly believe that the presence of Philip in Pensacola was not a coincidence. Major John Campbell said himself that the living conditions over there were the worst he had ever seen. Philip did not come in at Fort George from a farm nearby on the last days of the Pensacola battle. The Spaniards pounded Fort George for two months nonstop. Still, Philip managed to get out of it alive with many others, while the majority became prisoners of war or had to hide in the rough terrain of Florida. 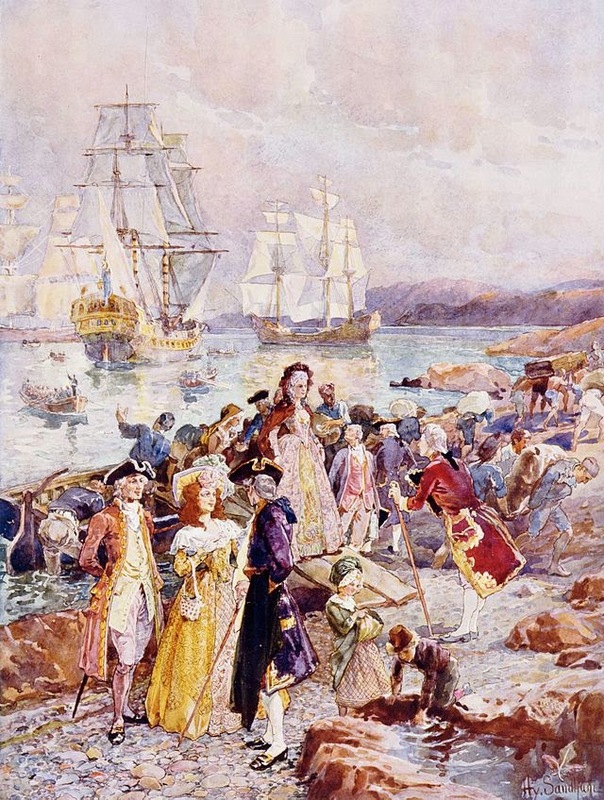 Not only he got out of it, but he stuck to his gun and reenlisted in another Loyalist regiment, the KAR. Consequently, Philip was animated by a deep feeling of loyalty that he maintained once in Canada. That feeling had started long before he landed in Saint John NB. If he was that much convinced, why did he showed up only at the very end of the ARW, like some believe? 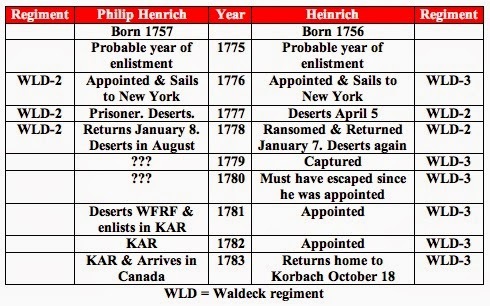 My answer is simple: he was involved in the ARW from the beginning to the end, and not only starting in 1781. He was one of the first Germans to arrive in New York in 1776 and one of the last to leave New York for New Brunswick in 1783. To recognize a soldier or an American citizen as my ancestor, I look for someone who has the same qualities as the ones shown with consistency by Philip Long, my Canadian ancestor. The nature of these personal qualities are much more important than a birth certificate that could belong, in the end, to somebody else. If you are looking for a document that will solve all the dilemmas surrounding the life of Philip Long, maybe it’s time for you to revise your strategies and to read a few paragraphs in a diary written during the ARW, like the one of Baurmeister. But, if you are looking for the one and only document that will prove that you were right about Philip’s origins from the start, good luck! Confidential Letters and Journals 1776-1784 of Adjutant General Major Baurmeister of the Hessian Forces. Over the years, many of us have found « stand-alone » documents that could be related to Philip, my ancestor. Myself, I have an extended collection of these birth certificates. I’m absolutely convinced that they are not related to my ancestor. Why? You have certainly realized that I’m trying to find documents about Philip that are in line with the knowledge that we have about him. I believe that Philip was a soldier in the ARW, and not a farmer from Pennsylvania who got involved in the ARW in Florida in 1781. Between 1781 and 1783, Philip was a member of cavalry regiments. Do you really believe that Philip was a regular American citizen who decided to put his skills at the service of a Loyalist regiment on the spur of the moment when the issue of the war was decided or almost? If you believe that, then you are looking for a birth certificate in the New York area where Loyalists were in great number. The problem is, there is none, not in New York or anywhere else in America or in the British Isles. Even if you were to find such a birth certificate, what makes you think that it will finally be THE birth certificate of Philip? In fact, you are probably looking for a birth certificate with his death certificate in mind. Philip died in 1832 at the approximate age of 90. Consequently, you are looking for a birth certificate of an approximate date. Not much to start with! Philip’s life has become, over the years, a kind of « fill-in the blanks » story. His life is full of holes, dark areas and uncertainties. It’s hard for us to live with the unknown. So, one way to alleviate this source of anxiety is to fill-in a few of these blanks. 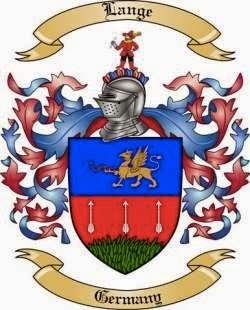 If you intend to look at the family trees that many have built on Ancestry.com about Philip’s family, brace yourself for quite a shocking experience. Some have found Philip’s father even though they don’t know where Philip was born. Not one of these tree managers is explaining his rationale to back it up. I’m not convinced that these short-cuts are the best way to gather more facts about Philip Long. 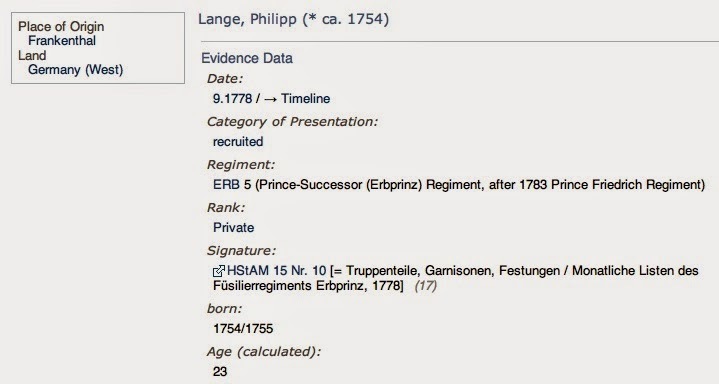 To certify that my rationale is linked to Philip, my ancestor, I know only one thing that will decide if I’m right or if I’m wrong: find other living relatives of Philipp Lange in Germany and get a DNA test from one of them. My research is about getting undisputable facts and not another story about Philip Long. in Canada starting in 1783.